kandeej.com: Peek in My Closet & today's make-up! I have fallen in love with a hanger! These "skinny hangers", that are velvety, and feel like they are flocked, like a christmas tree- are amazing! 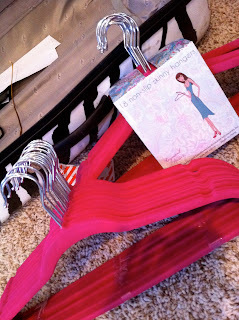 Not only can you fit like 50% more clothes in your closet because of their "skinny-ness"....but your clothes do not slip off the hangers! I love these...I got mine for super cheap at Marshall's and in hot pink!...they were way more expensive at Bed Bath & Beyond...and they only had cream and black. Let me know if you like this little bonus video...this will not be on youtube either....I want to do some special stuff for all my "kandee blog family"....I heart you guys and all your comments that make my heart so happy!!! HAVE FUN AND COME WITH ME AS I GET READY!! Love the routine & how simple it was! I'm sooo anxious for Princess and the White Stick to arrive! I love watching your daily posts! Good luck with your upcoming special delivery! I can't wait to see/meet new baby Johnson! Super Funny and sweet for sharing. Can't wait for the ebay garage sale too!!! You're closet is soooooo AWESOME!!! I loooove this vid its sooo cute... and i loveee you kandee sooo much. and good luck with upcoming special delivery can't wait till your little baby is here. Good luck to you and baby Indugu!!! :D We are all anxious and keeping our fingers crossed for you both! It's amazing how easy you do makeup. What you do in less than 5 minutes it took me half an hour :D.
Tomorrow is a very important day for me, occupationally speaking but involves many personal dreams, much effort and sacrifice of life, I am very nervous and I knew that if I saw your videos make me feel better. My real sister is pregnant too, her due date is in April, so feel a special affection towards you. I think about the two all the time, so that everything goes well for you both. My nephew is a boy. Well, I do not want to bore anyone with my stories. A BIG KIS and always on my mind my my two future moms. Loved you're make-up routine video! Thank you! <3 Hope you had a wonderfully blessed day Kandee! Much much much love! Wow! It looks like you have a nice big closet. I just wanted to let you know I love those hangers also. I have them in all my closets. You can buy them from HSN and they are so much more cost effective then buying at local stores. The brand is Joy Mangano and they have lots of colors to choose from, and kid size also. Waiting for little cupcake....can't wait to see her! Love the bonus video! I adore your videos, I read both your blogs and subscribe to all your channels... I feel like we're best friends even though you don't know me haha! Good luck with baby! Btw my vote is definitely for Princess GooGoo Head! HaHa! Oh My God , It's Pebbles!!!! Takes me waaaaay Back. You look so upbeat and excited! Wishing you the best in these next few days and hoping cupcake comes soon for you. I can't open the video :( I'm sure you have an awesome closet! Hope you are great and your muffin is baking up great!!! xoxo! Can't wait to hear that the baby is on the way. Don't worry Kandee, I dance when I put my makeup on too... But sometimes I end up with mascara in my eye(: ha ha ha! can't wait for Princess and the White Stick!! Hey there Kandee! Glad you are feeling so great! I'm still trying to get past my nauseousness!! 17 weeks tomorrow! Can't wait to hear when she gets here! I adore your closet. I love how organized and awesome it is. Love, love, love it!!! Kandee you are my favorite guru! Thanks for sharing! Can't wait for more videos....they always put a smile on my face! This is one of my favorite videos you have done. You are the coolest mom ever and have a great voice. That would be so neat if you did an ebay sale! Hope all is well and everyone is feeling better today. Yes! Loved the bonus video! Wondering why you let the primer coat of mascara dry before adding the black coat? Also, would love to see how you do your skin stuff for everyday makeup - foundation, blush, etc. :) This was an awesome video! I also wonder how you look so great ALL the time!! :) XOXOX, shannon w.
Kandee you are absolutely gorgeous! Loving the 80's beats!! Congrats on your upcoming babe. I have only recently discovered you but would love to see you do a tutorial for very pale green eyes (when you have a moment in the near future) - there is so little out there and the advice is always plum colors but I have come straight to the guru!!! All the best with the birth!! I stumbled upon your site and love it! The youtube videos are so helpful and you are so adorable! Thanks for sharing all your make-up tips with us and I wish you nothing but happiness with your new sweet pea. Off to buy some light and dark foundation to try the contouring trick! You are so inspiring! Thank you! Kandee you are AWESOME! Just thought I would let you know thanks for all of your videos and blogs they are so helpful and you always make me smile because you are so happy with life! I was wondering what you used on a daily basis... thanks for sharing! I don't look good in black eyeliner and was wondering if you could do a make-up tutorial using another color for those of us that look to harsh in black eyeliner? Thanks! I luv this song cause of you lol. I love that lil beat. I love this song! haha I know I already said that. Kandee you are so amazing, well I knew that ever since I watched one of your first vids in early '09. I read both of your blogs everyday so I don't miss anything haha. Magnifico :-) And so quick too..guess that's why you're the expert, haaa, haaa. Check out MY pregnancy and makeupblog!! I love any video you make. Ahhhhhh, your closet! I want to steal all of your fedoras! :D I would love to have my own walk-in closet some day. But at the moment, my room IS the size of a closet, haha. One day! And I loved the simple makeup video. Definitely do more in the future! Maybe cuppy cake will arrive tomorrow. So exciting! I'm sending all my love to you and your beautiful little family! I loved the video Kandee! Hee hee... awesome music! Videos like that are so fun!!! Ahhh so excited to meet 'PRINCESS AND THE WHITE STICK'!!!! Yay! I hope everything is going well- and I'm praying for you to have a healthy happy little one and labor! This is prob one of my fav videos that you have done! HOW FUN! <3 ya,and your cupcakes! EVEN AT THE END OF PREGNANCY, YOU DO NOT FORGET YOUR FANS! Okay one quick question: In this video you waited a long time between putting on the mascara primer and the mascara...I thought you were supposed to put the mascara on when the primer was still wet? Does it make a difference? You are so funny & cute as always...I'm so excited for your baby to arrive!! kandee, thank you so much for letting us all into your life! we all know it's straight from your heart, and it means so much to us! i personally love this video, your preggy videos, and all the little peaks you give us into your life. you are such a beautiful, talented woman and we are all so thankful for you! thank you for brightening up our days! it is beyond generous and kind of you to put all the effort and work you do into posting these sweet videos just for us! we appreciate them more than you can ever imagine! you have such a beautiful heart. i see the Lord shine so brightly in you! thank you thank you THANK YOU for everything you do! your closet is amazing! just like you kandee! I love u and adore u soooooooooooooo much..
Is that song by Nu Shooz your favorite song? You should do a video telling us what your favorite songs are! I can't wait for baby! It's amazing that even the simplest makeup look can be super pretty. This was so much fun to watch! I liked it! And I cannot wait until your ebay yard sale (or should it be called cyber sale, hahaha), bring it on sista!! hahahahaa! You are just too adorable!! You remind me so much of my soon to be sister in law! I can't wait for your little one to get here! Oh and I LOVE the idea of you making a video of your favorite songs to get ready too! Those fun songs that just put everyone in a good mood! Lolololol <3 You're just too fabulous. just fabulous!... that made my day...hahaha. Anyway I can't wait for you to have your baby... good luck in everything && know that we are all here for you. Good Luck with everything God Bless you and your family! Can't wait to see "Sally"... ha ha that's my name!!! Your so cute. I don't blame you from keeping stuff off of Youtube. People are so mean. I was watching one of your videos and reading some of the comments and I think my jaw dropped to the floor. I was so sad at the mean and fake things people came up with. You must be a strong woman because comments like that are hard to bear. Know that your blog family loves you a ton! Sending you warm love and wishes. Kandee your the best ever! I love your little blog surprise videos. ENJOY your new baby (whenever it comes ahahah) and I know God will bless you for all the happiness you give to people! Love you! I love these kinds of vids. So much fun. I love music from the 80's! Reminds me of my childhood. Best music everrr. Good luck with having little cupcake. Everyday I check your blogs a few times hoping to see your new precious cupcake. Ooh I'm re-decorating my room and organizing my closet so thanks for the tip of the hangers!! I've gotta get some of those!! I hope you're feeling well and I hope the little cupcake is done baking soon!! That's my ringtone like right now!!! I love that song! Sorry I meant to specify "I Can't Wait" is my ringtone right now...lol! thanks for that, made me happy! love your positive attitude, you rock! i love you kandee this is beautiful!! great video! I've never tried to put on make up while dancing but now I totally will! haha and I just love this song! <3 I heart u Kandee! Love those hangers! I also bought several packs at Marshall's and TJ Maxx. They are seriously the best! Much love! Kandee! You have such a great personality and I loved this video! Would love to know what eyeshadows your wearing too. Love those hangers- they are great! Roomy looking closet- you deserve it! the hangers look so great! the video s really fun to watch. it ws so cute when your kid was dancing hahaha! I love the video but the camera doesnt need to be so up close to your face when your doing your makeup. Besides that, i love it! i love your gold bag on wheels, where did you find it. i love everything gold. and where did you find the pink peonies. i only find pink roses. i have never seen the fabric peonies. you look fabulous. peonies is a love flower according to feng shui philosophy. aww! you're so cute! I love your closet!! You are cracking me up lol! Those songs are bringing back so many memories. I'm going to have to go through my old cd's or download them from iTunes. You look fabulous. I'm wishing you a healthy delivery. Can't wait for baby to come!!! Have you picked a name yet? I loved hearing Pebbles...it has been years & years since I have heard that song, what good memories! I am so excited for you to have the baby! I check my email first thing in the morning to see if the princess is here!! Good luck & God bless you and your adorable family!! Aww Kandee I do love your funness, is that even a word?! ha ha. This was my revision break video and it made me smile and dance a little bit ha ha. I can't wait to see babyyyy! Need some encouragement? Head over to www.we-are-precious.blogspot.com a blog for christian teens. Great to see other christian bloggers :D keep it up! You are soooooo beautiful; I love watching you do your makeup! What mascara did you use - looked like it was a prep of a white?? And then the other end was the mascara? Those hangers are so cute lol! I never knew there was a such thing as cute hangers.. Love the video, your too funny! I dance while getting ready tooooo....haha....makes the day go much better! Love the little blog video treat! Congratulations on your soon-to-be-here baby girl! Kandee!! You are so fun and happy, it makes me smile and happy to see you do the same. :) Your children must have such great positive energy everyday with a Mommy like you. You're so fun and sweet. God Bless you and your's. P.S. I like the video, definitely make more! You are so fricken gorgeous!!! The only reason why you have any haters is because you're so cool. You have awesome style and you're just a very down to earth person. Don't let those silly people get you down ever! Kandee, your videos always put me in an awesome mood! I like being able to see what your daily makeup routine is like. And I also love both the songs in your video! What are some of your favorite 80s songs? AAAaaaaah!! I love those hangers!!! Love the special video! You always put a smile on my face! Love your closet! love the blogs you share with your Kandee family! I love your video kandee!!!! And hope u and cupcake are doing well!!! She is soooo comfortable inside your belly that she doesn't want to come out jajajaj.... hope you had a great day!!! loving you all the way from Honduras! This was awesome, I'd love to see more!! omg i loooveee "i can't wait" by nu shooz. keep on doing them (these kind of video) please. god bless ur beautiful kids. PS; i think ur jordan is gna grow up to be MOST HANDSOME MAN EVR! Or maybe donate it to goodwill. Or a homeless shelter it will help those in need. Jordon is very handsome 13 year old! i actually lovedddd this! all the best can't wait for your little cupcakes first youtube vid! Love this video! please post more like this one. ooooh I can't wait for the ebay sale! I also <3'd the video!